Just a couple years from now, all forms of art will be banned. Bummer. But that does leave a lot of out-of-work actors and actresses without much to do. Those that are hanging around Hollywood's former glorious studios have decided they want to see whose fictional transportation methods are the fastest. They're also on the lookout for Effixium. But really, it's about speed. 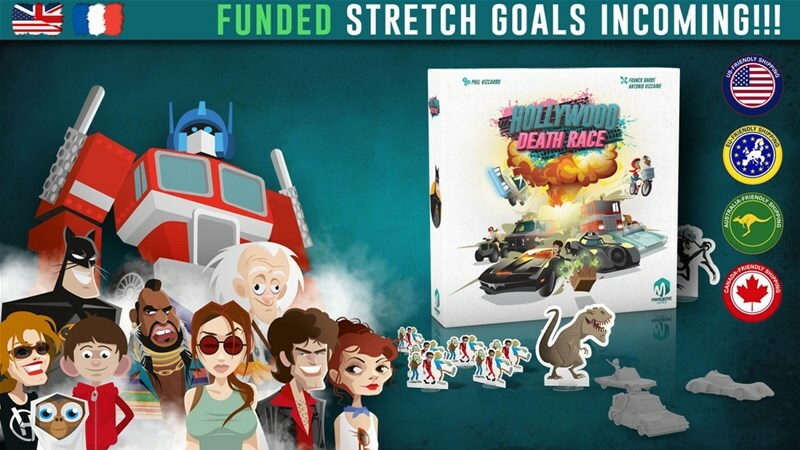 That's what's going on in Hollywood Death Race, a new board game up on Kickstarter now. Get ready to burn rubber and take part in crazy races through Hollywood studios! Hollywood Death Race is a thrilling racing game for 2 to 6 players, ages 8 and up and lasts 45 to 90 minutes. In a not-so distant future, all art forms are banned, and Hollywood is now a no-man's land. You and other doppelgangers deprived of work find yourselves clandestinely taking part in crazy races inside a huge Hollywood cinema studio, going from movie set after movie set, in search of glory, useful objects... and Effixium (mostly Effixium). Easy to learn and easy to play, build your own track thanks to modular boards (each one representing a different movie set and proposing its own gameplay and challenge), choose your vehicle among a roster of wacky vehicles and drivers! No holds barred! The game is already over its funding goal with still 18 days on the clock.